There are some dishes that I will always connect with my childhood. 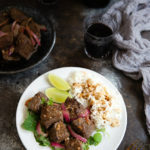 Vietnamese Shaking Beef is one of those dishes. Until recently, I had never made it before. Shaking beef (or bò lúc lắc as I have always called it) was a dish only my father made. My mother, who did the large majority of the cooking when I was growing up, had a huge repertoire of dishes in her cooking arsenal. My father (at least, the way I remember it) had this one. If my mother was working late and my father had been assigned dinner duty, I knew it would be shaking beef. He made it a certain way, in a certain pan, and he smiled in a certain way when he said “lúc lắc”. My father’s version of this dish is very basic, using mostly oyster sauce in the pan sauce. Though I would never say no to my father making me his bò lúc lắc, I have to admit I prefer this version with its more multi-layered flavors. The combination of soy sauce, lime juice, sugar, and fish sauce hits all the sweet-sour-tangy notes. There are many ways to serve shaking beef but my favorite is with hot cooked rice which is how I always ate it growing up. You can eat it more like a steak salad if you serve it on a bed of watercress. Or you can get fancy and toss in a handful of microgreens. Now, I just have to decide whether to make this for my father next time I have my parents over for dinner. Place the beef in a medium bowl and sprinkle the beef with a couple of pinches each of salt and pepper and drizzle with 2 tablespoons soy sauce. Toss to coat evenly. Set aside. In a small bowl, stir together lime juice, fish sauce, sugar, and 1 tablespoon soy sauce. Set aside. In a large skillet, heat 1 tablespoon oil over medium-high heat until almost smoking. Swirl the oil to coat the pan and then add the beef in a single layer. Sear the beef and let cook undisturbed for 1 1/2 minutes. Flip the beef and cook undisturbed for 1 1/2 minutes more. Transfer beef to a bowl or plate. Set aside. Return the skillet to the stove and add remaining 1 tablespoon oil. Add the garlic and cook over medium heat until fragrant, about 30 seconds. Pour in the lime juice mixture and any beef juices from the bowl (but not the meat). Cook sauce over medium-high heat until sauce begins to thicken, 2 to 3 minutes. Add the beef and onions to the skillet. Continue cooking, scraping up any browned bits on the bottom of the pan, until the sauce coats the beef and the onions have softened. Serve beef with steamed rice drizzled with pan sauce. If desired, toss watercress with lime juice and salt and serve along side. You can reduce the sugar to 1 tablespoon if you’re watching your sugar intake. The flavor is slightly different but still very good. Sounds delicious! I admit, I can’t remember the last time I bought sirloin steak… I think I’d just wait for the NY strip to go on sale and use that. Is that the minced garlic dotting the steak in the picture, or did you add a little chopped peanut for garnish? No peanuts, just garlic dotting the steak. There’s a very generous amount of it. Using NY strip for the beef would be awesome!